FULL TIMEDEMONS WIN! The Demons have come out and upset the Tigers to win by 17 points. Keep your eye on the red and the blue as they are on the rise! BEHIND DEMONSDawes roves the spill of the ball, as he snaps for goal and misses away to the left. 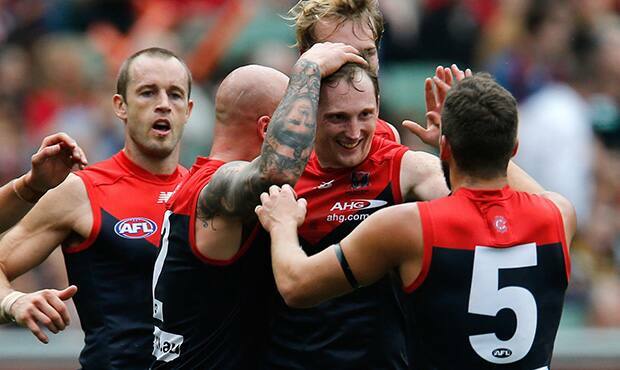 The Dees will go into their bye next week with their heads held high, winning their third game of the season. The Tigers season is in tatters, as they will end the round on a 26 win-loss record. GOAL DEMONSKennedy-Harris comes out on the lead and he takes a strong overhead mark 40m from goal right on the boundary. He nails it! THE DEES ARE HOME!!!! There is four minutes left on the clock, the Dees lead by 10 points. Another goal would make the result a certainty. GOAL DEMONSWatts gathers the spill of the ball, he takes a standing shot on goal and he kicks his third goal of the day. Has Watts just kicked the sealer? GOAL TIGERSCotchin takes the mark 30m from goal, he plays on, runs to the goal square and kicks a much needed Richmond goal. The Tigers trail by four points. BEHIND TIGERSCotchin takes the spill of the ball, he seizes the opportunity at a shot on goal but pushes it away to the right. The Demons have less than seven minutes to survive to win their third game of the year and leap frog the Tigers on the AFL ladder. BEHIND TIGERSEdwards with a shot on goal and it is inaccurate as it goes through for a point. A great crowd of over 56900 people have come out today to pay tribute to one of the game's legends in Tom Hafey, who passed away during the week. BEHIND TIGERSGriffiths marks 40m from goal on a slight angle, he comes in and once again he is offline, for his third behind for the game. The Tigers just cannot afford to concede another goal as it could be curtains for them today. GOAL DEMONSBail takes the mark on the 50, as he spots Watts on the lead and he marks it. He comes in from 10m out. He nails it! The Dees with some breathing space! BEHIND TIGERSA long kick from Griffiths on the 50, but he pushes it away to the right for a point. Time is not a factor as yet, with both teams still well and truly in it. GOAL TIGERSLloyd tackles Terlich as Martin comes over to lock it in 20m from goal, as the umpire awards a free kick to the Tigers. Lloyd splits the middle. GOAL DEMONSVince has a long shot on goal from 55m out, it comes around and around, it is through! The Dees lead by 14 points. This game is really in the balance at the moment, as another Melbourne goal could well sink the Tigers. GOAL DEMONSPedersen comes out and takes the mark 40m from goal, near the boundary. He kicks it well and the Dees are back out to an eight point lead. The Tigers are back within striking range, but seem to be losing a lot of the ruck contests at the moment. GOAL TIGERSLennon takes the mark from the short pass and he slots it through for a great running goal. This Lennon is not just watching the wheels go round and round! A slower start to the final term after a goal fest that greeted us at the start of the third term. We are back under way for the final term as the question beckons as to whether Melbourne can get the job done. We will find out in about 30 minutes. THREE QUARTER TIMEThe Demons lead by eight points at the final break, after the Tigers kick 2.8 to Melbourne's tally of 5.1 for the term. 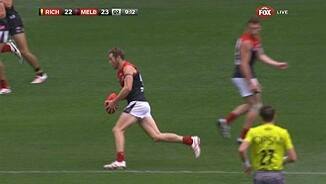 Some desperate tackling by the Melbourne midfielders, as they try to deny the Tigers of a late goal. BEHIND TIGERSLennon with a hurried high shot on goal but it is away to the left for his first point of his career. SUBSTITUTION DEMONSRiley has been substituted from the game as Kennedy-Harris has his chance. BEHIND TIGERSHouli marks 41m from goal directly in front, he takes the set shot on goal and he pulls it away to the right for his fourth behind of the season. The Dees would love another goal before the final break, just to give them a bit some breathing space. BEHIND TIGERSEllis sweeps through as he has a quick shot on goal and he pushes it away to the left. Tigers InterchangeDavid Astbury and is possibly out for the game. Tigers InterchangeReece Conca off due to an injury. Welcome to MCG for the Richmond v Melbourne Round 9 clash. RICHMOND'S season is hanging by a thread after going down to Melbourne by 17 points at the MCG on Saturday afternoon. The Demons' third victory came after they won the second half with the Tigers burning chance after chance due to untidy disposal inside 50. They got within four points with five minutes left but the Demons held firm and kicked the last two goals of the game. Perhaps it was post-bye lethargy or a letdown after a highly emotional week following the passing of Tommy Hafey, but the Tigers' sloppiness may well have already cost them a finals berth. After eight games, they've managed just two wins – making an appearance in September just an outside chance. In the middle of the second term, shortly before the Demons hit the front through a goal to Matt Jones, game great Leigh Matthews said the two teams – light years apart in 2013 - were now "on a par". 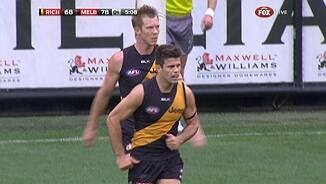 "Richmond has only won a couple of games – they are nowhere near the team they were last year," Matthews said on 3AW. The Demons were also untidy early but showed great fight, with Nathan Jones collecting 33 possessions and limiting the influence of Trent Cotchin. Dom Tyson (23 and nine marks), Jeremy Howe (24 and eight marks) and Daniel Cross who kept Brett Deledio to 24 possessions were among the best, as was Cam Pedersen, who presented well in the forward line that was missing James Frawley. 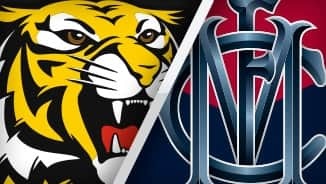 Melbourne coach Paul Roos said securing the win when the Tigers were so emotionally motivated was highly significant for his emerging team. "Even though we turned the ball over a lot today, there were periods of the game where we controlled the ball well and we were able to use our feet and get the ball down the field to our forwards," Roos said. "For us to beat them in those circumstances was huge." But for Richmond coach Damien Hardwick, the loss cut deep. 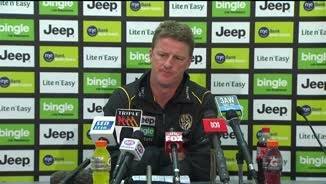 Hardwick grew increasingly emotional throughout his post-match press conference, particularly when talking about the knee injury sustained by the in-form and luckless defender David Astbury. "There's not much I can say guys ... disappointing," a shattered Hardwick said. "[It's] incredibly disappointing - one, from a seasonal point of view, but then after the death of an icon of our footy club, to dish up that kind of performance was really disappointing. "Probably the one thing we were really poor at today was winning those crucial one-on-one contests. "Credit to them - they turned up to play and we didn't." It was stoppage central before half time, with 15 secondary stoppages making the game a stop-start, congested affair. 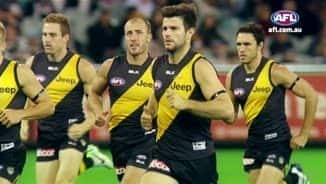 The Tigers reverted back to a tall forward line with Jack Riewoldt and Ben Griffiths playing inside the arc with Sam Lloyd and Tyrone Vickery pushing further up the ground. After taking a three-point lead into the third quarter, the Tigers used their substitute to bring in draftee Ben Lennon in place of Shaun Hampson. It had immediate an effect with Lennon nailing a quick goal with his first kick in AFL football. It snapped the Demons' momentum, which was building after back-to-back majors gave them an eight-point lead. But when Astbury went down later in the quarter, the Tigers' early use of the sub appeared the wrong decision and they trailed by eight points at the final change. Astbury joined in the three-quarter time huddle on crutches with ice on his knee, with leading sports medico Dr Peter Larkins telling 3AW he believed it was a suspected dislocated patella that could cost him 6-8 weeks. It appears to be the same injury he sustained to his other knee in round 12, 2011 that cost him a year on the sidelines. The first goal of the final quarter went to Lennon but the Demons kicked five of the next seven to win the game. Neville Jetta withdrew minutes before the first bounce after succumbing to gastro during the warm up. 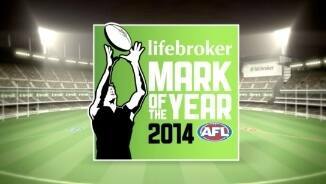 He was replaced by Jimmy Toumpas, who had 15 disposals in a creditable performance. 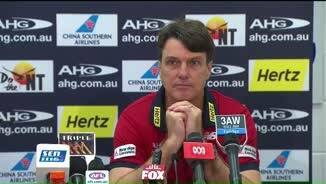 Melbourne: Neville Jetta (Gastro) replaced in selected side by Jimmy Toumpas.